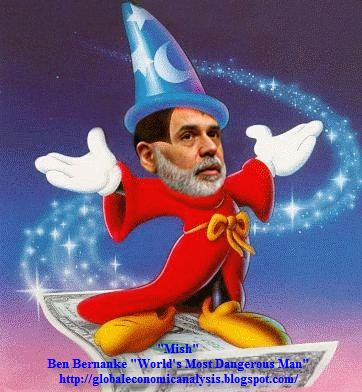 Mish's Global Economic Trend Analysis: Ben Bernanke "World's Most Dangerous Man"
Ben Bernanke "World's Most Dangerous Man"
Sometimes you are pleasantly surprised by things you find in mainstream media. This is one of those times. Please consider Dismantle Bernanke's 'Happy Conspiracy' ... now! by Paul Farrell of MarketWatch. The same clueless Congress that did nothing when Paulson and the Goldman Conspiracy nearly bankrupted America is now about to give Bernanke's out-of-control "Happy Conspiracy" even more power, and another bigger chance to destroy our capitalism. Paul Farrell of expounds upon all all six of those points so inquiring minds will want to read his article in entirety. 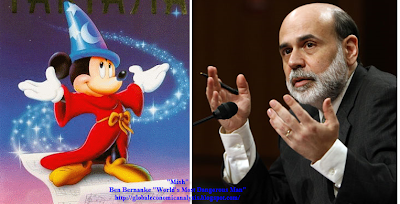 In Buying into the Rally, Hook, Line, and Sinker I compared Ben Bernanke to Mickey Mouse in the Sorcerer's Apprentice. Thanks go to "The Librarian" for this image comparison. "Jade" takes the concept one step further with this combination. With thanks to both "The Librarian" and "Jade", it's time for a sing along. Don't be shy. You know the tune.